Non-alcoholic fruit beverages; natural juices; nectars; non-alcoholic non-carbonated drinks; and preparations to make beverages. On Monday, July 28, 2003, a canadian trademark registration was filed for the above pictured logo by BON APPETIT, S.A. DE C.V. Km. 27_Carretera a Sonsonate, EL SALVADOR . The Canadian IP office has given the trademark application number of 1185782. The current status of this trademark filing is Registration published. The correspondent listed for is BERESKIN & PARR LLP/S.E.N.C.R. 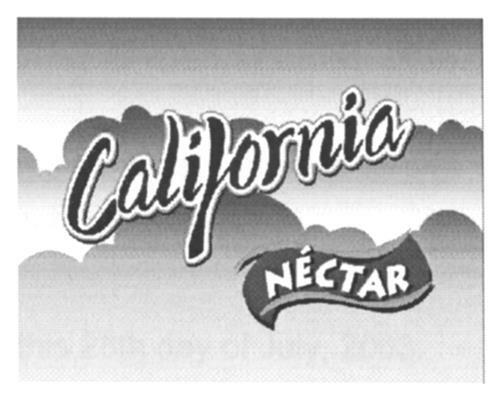 of SCOTIA PLAZA, 40 KING STREET WEST, 40th FLOOR, ONTARIO, CANADA M5H3Y2 The trademark is filed in the description of Non-alcoholic fruit beverages; natural juices; nectars; non-alcoholic non-carbonated drinks; and preparations to make beverages. .
Mark Disclaimer: The right to the exclusive use of the words CALIFORNIA and NECTAR is disclaimed apart from the trade-mark. BON APPETIT, S.A. DE C.V.
(1) - Non-alcoholic fruit beverages; natural juices; nectars; non-alcoholic non-carbonated drinks; and preparations to make beverages.